James Hiteshew was born on October 8, 1930, in Weston, West Virginia. He attended the U.S. Coast Guard Academy from 1949 to 1952, and then enlisted in the Aviation Cadet Program of the U.S. Air Force on August 19, 1952. 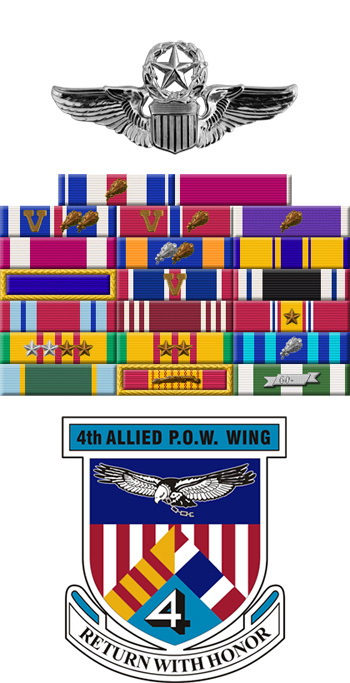 He was commissioned a 2d Lt in the Air Force and awarded his pilot wings on September 16, 1953, followed by F-84 Thunderjet Combat Crew Training from November 1953 to February 1954. His first assignment was as an F-84 pilot with the 510th Fighter-Bomber Squadron of the 405th Fighter-Bomber Group at Langley AFB, Virginia, from March 1954 to May 1956, and then as an F-84 and F-100 Super Sabre pilot with the 55th Tactical Fighter Squadron of the 20th Tactical Fighter Wing at Wethersfield, England, from May 1956 to May 1959. Capt Hiteshew next attended B-47 Stratojet Combat Crew Training from May to December 1959, followed by service as a B-47 pilot with 544th Bomb Squadron of the 384th Bomb Wing at Little Rock AFB, Arkansas, from January 1960 to June 1962. His next assignment was as a B-47 pilot with the 529th Bomb Squadron of the 380th Bomb Wing at Plattsburgh AFB, New York, from June 1962 to March 1966, during which time he received an Operation Bootstrap assignment to complete his bachelor's degree at the University of Omaha from July 1965 to January 1966. Maj Hiteshew then attended F-105 Thunderchief Combat Crew Training from March to September 1966, followed by service as an F-105 pilot with the 354th Tactical Fighter Squadron at Takhli Royal Thai AFB, Thailand, from September 1966 until he was forced to eject over North Vietnam and was taken as a Prisoner of War on March 11, 1967. After spending 2,186 days in captivity, Col Hiteshew was released during Operation Homecoming on March 4, 1973. He was briefly hospitalized to recover from his injuries at Andrews AFB, Maryland, and then served as Executive Officer of the 68th Bomb Wing at Seymour Johnson AFB, North Carolina, from July 1973 to September 1975. His final assignment was as Commander of the Air Force ROTC detachment at the University of Tennessee from September 1975 until his retirement from the Air Force on December 1, 1979. James Hiteshew died on February 7, 2006, and was buried at the Evergreen Memorial Cemetery in Goldsboro, North Carolina. 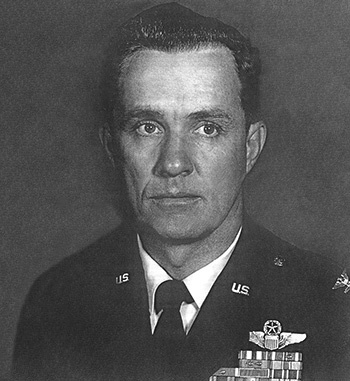 Major James E. Hiteshew distinguished himself by gallantry in connection with military operations against an opposing armed force as an F-105 Pilot in Southeast Asia on 11 March 1967. On that date, Major Hiteshew was the leader of a flight of fighter-bombers of a strike executed against a heavily defended steel mill complex. Major Hiteshew led his flight directly to the target despite marginal weather conditions and the ever present danger of surprise interception by hostile aircraft and surface-to-air missiles. Pulling up to attack the target, Major Hiteshew completely disregarded very serious damage to his aircraft caused by hostile ground fire and successfully delivered his ordnance on target. By his gallantry and devotion to duty, Major Hiteshew has reflected great credit upon himself and the United States Air Force.